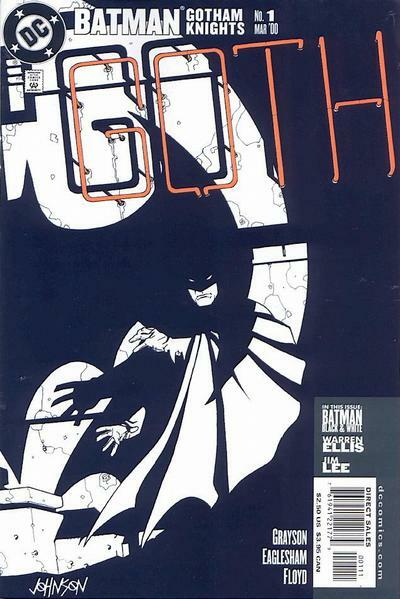 I’ll tell you more about where I got it in the future, but I recently picked up Batman: Gotham Knights 1. Let’s look at this (semi-)random back issue! We’ve got a nice black and white Batman from Dave Johnson, great work as usual. Main story is written by Devin K. Grayson, penciled by Dale Eaglesham, inked by John Floyd, letters by Bill Oakley, colors by Pamela Rambo with seps by Wildstorm FX, edits by Joseph Illidge and Dennis O’Neil. Gotham Knights 1 is a look at family, as Grayson’s work tends to be, from what I understand. An unnamed (and unrevealed at the end, unless I’m just dumb) narrator talks a lot about this case, and Batman, and how Batman has surrounded himself with teammates even though he cultivates the idea of himself as a loner. The theme of “the risk of LOSS is always too GREAT” is spelled right out on the second page. This takes place post-No Man’s Land and gives us a bit of the status quo of Gotham and the Bat crew. They’re investigating the death of a Senator and his wife in their home, the young son the only witness and survivor. This makes Tim Drake think that Batman will have a blind spot to the truth given the whole big thing that happened with his parents, and Tim is right. 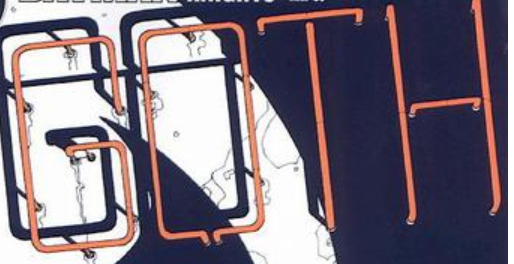 The case’s solution is easy to spot, but it’s supposed to be (and at least it’s a done in one issue and not a 6 issue hyped up run like the Azzarello/Risso one…spoilers?). The Eaglesham/Floyd team is a decent, serviceable superhero art team (although some of the faces are weird, and I’m not sure how old the son is supposed to be), with some especially nice linework on the faces on the page where Batman confronts the perpetrator. Colors are your typical darkish Bat palette, nothing outrageous, perfectly readable. A decent little tale, but nothing amazing. The street Robert Smith lives on…. The back up story in Gotham Knights 1 was the reason I picked it up, though, as it’s a Warren Ellis/Jim Lee B&W story (with Richard Starkings on letters). I think Gotham Knights was created to have these B&W backups, but I’m not sure. It’s a nifty little tale of Batman looking into a murder in the present day with juxtapositions of his various training methods, showing what skills he’s utilizing as he figures out the case. Nothing revolutionary but still well done. The part juxtaposing the death of Martha Wayne with Batman leaning over to gently close the dead woman’s eyes is very emotional. Jim Lee’s art is fantastic, though, as he’s using a Sin City style, stark black and white with no tones. Very fine lines. Nice action poses. A lot of vertical panels. One of the best Jim Lee stories I’ve seen. So overall, Batman: Gotham Knights 1 is a well-done-in-one comic that’s worth a look if you come across it in a back issue bin. The kid did it? The parents were abusive? How is a neon light casting a shadow? If it’s switched off, how does it show up so well in shadow? Ix-nay on the id-kay id-day it-ay! And I dunno about the neon light. What do I look like, a scientist? Hey, my toenails could stand to be done, so….